Order today and receive in 9 - 14 business days. Need it quicker? Contact us for rush options. 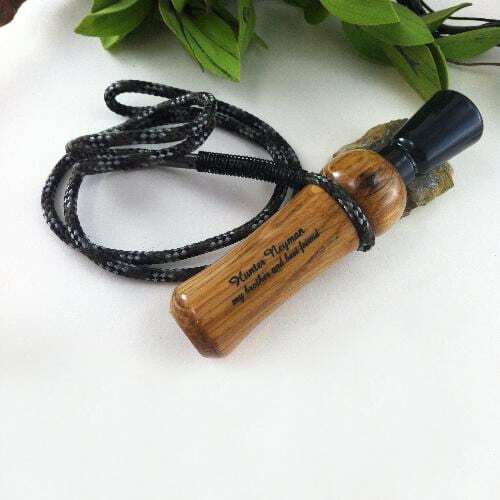 Our Whiskey Barrel Duck Call is a one-of-a-kind gift idea for the hunters and outdoorsmen in your life. No duck will be able to resist the noise that comes from this easy to use call. It’ll have you sounding like a flock of mallards ranging from high up to a feeding call. The acrylic holder is pre-tuned to perfectly suit every calling situation, from small ponds and marshes to big water lakes. The call is extremely lightweight which will keep it secure. And all that isn’t even the best part. Take your pick on the type of whiskey barrel that’s used to craft your call. We have three options to choose from: Jack Daniel’s, Jim Beam and Maker’s Mark. Since every piece of wood is different and has its own unique characteristics, no two calls will look exactly the same making uniqueness a guarantee. 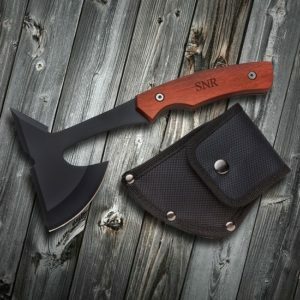 Whether you’re shopping for a groomsman, for Father’s Day or for the holidays, take comfort in knowing that this item has been designed and handcrafted as a token that will be treasured for many years to come. Engrave with two lines of text (up to 20 characters each) at no additional cost. Handcrafted from a real whiskey barrel: your choice of Jack Daniel's, Jim Beam or Maker's Mark. I got this for a special someone’s 21st birthday and it was a total hit, he LOVED it. Such a beautifully crafted duck call. Thanks y’all!